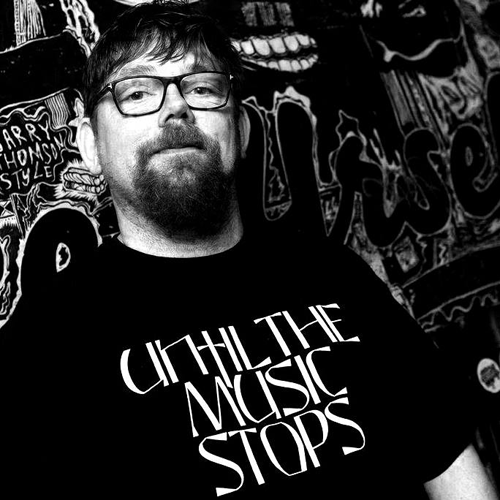 Richie Bisset is a musically knowledgeable button clicking whizz kid who’s been at the heart and soul of Edinburgh’s underground dance community for over 20 years. Growing up in the 80’s he listened to a wide range of music, the majority of which was synth pop. When the teenage years hit it was all hip hop like Public Enemy, BDP and NWA along with bits of acid house and hip house. In the early 90’s he visited Edinburgh’s legendary Pure and his first encounter with Derrick May engulfed him. His musical world exploded and a budding young trainspotting DJ was born. From then on he was mainly inspired by Detroit techno, from the first wave of artists along with early Plus +8 releases and especially Underground Resistance, not forgetting Twitch & Brainstorm from “Pure” and from frequenting other legendary Edinburgh clubs including Wave, Summer House and Soma. Richie was one of the two founders of Edinburgh techno record shop Windup which ran for a few years in the 90s. This all led to him DJing at lots of Edinburgh clubs including a residency at Soma. Putting on nights for the shop saw him play alongside the likes of Daniel Bell and Claude Young, who also wrote a track called ‘Windup’ out of respect for Richie’s underground shop.. Becoming a parent stopped his musical yearnings for a good few years before visits to Glasgow’s Optimo and a couple of stints at Ambideckstrous reignited his passion for playing music. These Optimo excursions encouraged him to dig through musical history, seeing just how much of it relates into modern dance music and heralding a new found admiration for industrial and cold wave styles which he was too young to appreciate at the time. Nowadays he teaches motion graphics and design at College, he’s taken up photography as a hobby and has become the go to guy for Edinburgh club promoters due to his very adept skills at club photography. He’s also became very proficient with Ableton so his future is once again on a musical quest ………………… providing he doesn’t become a grandparent too soon.